Truck cabs come in many different styles. 360 SMART CAR can help you find the best cab for your preferred make and model of truck, but before you go you can learn the basics with this guide. Standard cabs are small, with only two doors and one row of seats. They aren't great for those who want plenty of leg room or who drive with several passengers, but they do come with larger beds, which make them great for hauling heavy loads. Quad cabs or super cabs have two smaller suicide doors in addition to the two full-size doors in standard cabs. They provide more leg room than standard cabs, but they have smaller beds. 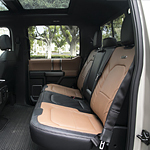 Crew cabs have four full-size doors and two rows of seating, making them much like sedans with truck beds. Mega cabs aren't as common as the other styles of truck cab, but they are far more comfortable. They are four-door cabs that are larger than crew cabs, and many people have compared them to minivans with truck beds.